I checked it out, took a few pics, looked for oil leaks (some, but normal for a bike its age), looked for rust (none, maybe painted over but couldn’t tell for sure), asked how much (P12k), then left. That night I researched. And when I say research, I mean Google like crazy. And I learned a lot. I already knew that the Honda Cubs, of which the C70 is a part of, was proclaimed by Discovery Channel in a top ten motorbikes in the world documentary as #1. It is the best selling motorbike in the world with almost 40 million made. Imagine that, FORTY MILLION units! More bikes than several countries’ populations many times over. I watched that documentary when I happened onto it on TV a few weeks ago and I remember getting concerned they weren’t giving the Cub its due as they counted down from 10 to 2. When they finally got down to #1 and started showing pics of the Cub I wasn’t surprised at all. I also learned they stopped making it in the early 90’s, and that the model above is actually an ‘EX3’, kind of a C70 clone, but not really a clone since it’s still a Honda. It was made in the late 90s in Malaysia (not completely sure of that), and sold here looking exactly like the old C70s. That meant it’s newer, which is good because that means it’s gone through less in its life. However it also meant that it’s ‘not really’ an original C70, as indicated by the square headlamps (the orig had round ones), squarish leg faring and mirrors. Mechanically it’s exactly the same with still the same engine type and brakes. By far most important and useful links on the web is this page from Motorcyclephilippines.com (sadly still a phpbb forum, a remnant of the early days of the web). The most hilarious page ever is this one from taguig.olx.com.ph. Someone was selling their 1997 EX3 for P40k, and the commenters were letting him know what they think about that. Important to note however that in the same comments people were still offering P25k for it, not a bad deal for a 13 year old 70cc scooter that’s obviously not practical for business purposes anymore. And I was hooked. In fact I think that pic is the single most compelling reason that lead me to buy it. But still, I wasn’t completely sure. I visited it again the next day and met the owner. I made a more thorough check this time, looking under the non – original seat (he said he couldn’t find a flat one like the original), checked the shocks and noticed a lot of missing parts like the chain cover and unoriginal, worn out foot pegs. However I noticed the new leg fairing, mirrors. It kickstarted immediately and was generally clean, which is always a good thing. I offered 8k for it and he agreed. I think the reason is he’s selling it so quickly is that its sitting beside other more modern scooters which get more attention. This model looks like the ones used by local Indian migrants offering small time ‘5-6’ loans or used to peddle puto on street corners. But to me it looks like a classic, or at least a classic to be. So now I own a 1998 C70 based Honda EX3, which I am now trying to find a way to transport from Makati to Sta. Rosa. I’m waiting for confirmation from a long lost high school batchmate to borrow his L300 school van on Sunday (amazing how I suddenly revive long lost relationships when I need something), but if I don’t get it, I’m actually thinking of riding it all the way home, which might be the 2nd most stupid thing I’ve done this week. PS: I have some good Honda Cub memories of my own. Growing up in Tiaong, Quezon, my cousins had a 1970’s PC 50, a 50cc. It had pedals which I read somewhere ‘helped it climb steep uphill’. I often daydreamed and wished they still had it. I remember seeing it rot at the back of the garage in our house there. Unfortunately I can’t go over there anymore due to an unfortunate family situation. Anyway here’s a video of one, where the owner kickstarts it alive after its been sitting at a garage for 14 years. This entry was posted in leslie and tagged c70, ex3, honda cub on November 26, 2010 by Gabriel Mercado. Honda ex3 has c70 engine from japan but the body is assembled in malaysia. 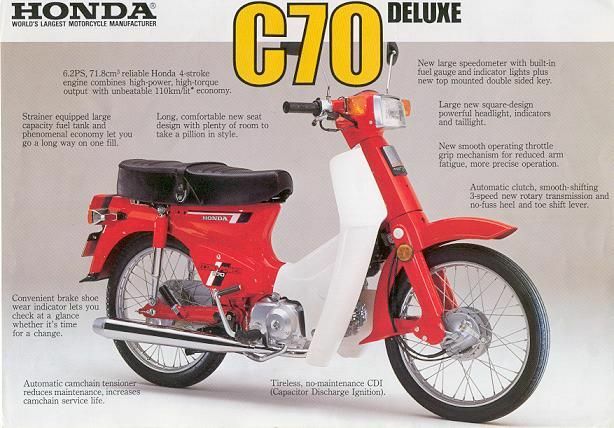 Still, both ex3 and c70 deluxe is considered a super cub.